Corn is usually described as “wind pollinated,” but honey bees love to gather its pollen to take back to their hive to feed to their babies. 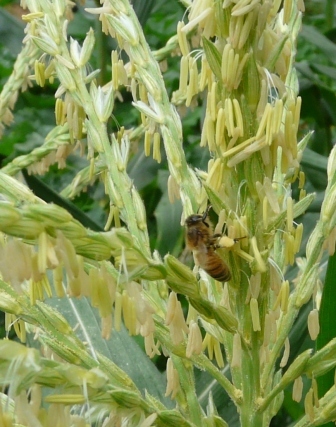 As the bees rummage through the corn tassels, they release clouds of pollen that drift away to land on the silks of the female flowers. These silks receive the pollen, then the pollen’s sperm cells migrate down the silks to fertilize the eggs in what will become the “ear” of corn. On days when the wind is calm, bees seem to be the primary cause of pollen movement. 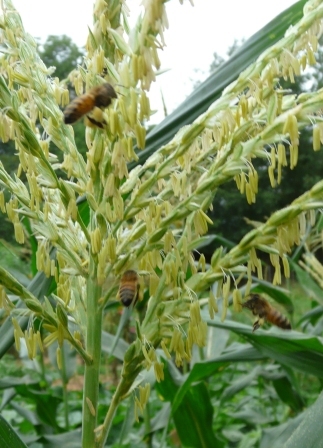 Corn is therefore perhaps better thought of as both wind and insect pollinated. Honey bee gathering corn pollen into the "baskets" (corbicula) on her hind leg. These baskets are made of combs of bristles. The garden is out of control -- photosynthetic anarchy. 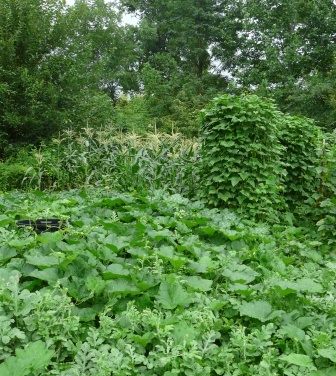 Beans, corn, cucumbers, watermelons and squash vie for space in this shot. Quite a change from the diesely air and cracked concrete of Pittsburgh. This entry was posted in Apis mellifera, Garden on July 30, 2011 by David George Haskell.